Genreal Knowledge from Vicious Vapors, Inc.
No better place to post. Can Vaping help reduce COPD Harm? New study suggests it might. About a year ago, a couple of good friends invited me to help them run a vape shop and eventual e-juice manufacturer in my hometown (Louisville, Colorado). We in this industry believe vaping to be potentially enormously beneficial to public health, and we’ve been dismayed to see it take a pretty stern beating in the public arena. This, along with the FDA’s recent ruling in favor of strict regulation and all of the various local ordinances popping up, have prompted me to action. Well, to list-making at any rate. Because unless you go out of your way to be informed, chances are you’ve been exposed to more misinformation than truth about what the media calls “e-cigs” and what most others call “vaping.” Why is that, by the way? Glad you asked. When most people think of an electronic cigarette, they think of the product pictured above on the far left. They look like regular (“analog”) cigarettes, you buy them at a gas station, and (if you buy Vuze or Blu, the two most popular brands) they are made by tobacco companies— Imperial Tobacco and RJ Reynolds, respectively. The cartridges in these come pre-filled, and must be replaced with new cartridges. They have very limited flavor selections, and are ostensibly a simple—perhaps healthier—replacement for cigarettes. Yet despite their impressive sales numbers, the vast majority of those who permanently quit smoking in favor of vaping do not use them. My store doesn’t even carry them. In fact, no vape shops do—just gas stations and convenience stores. In an actual vape shop, you’ll find products like those in the middle (commonly referred to as APVs—Advanced Personal Vaporizers—or “Vape Pens”) and on the right (“Vape Mods”). APVs (most made by Chinese companies like Innokin) contain electronics allowing the user to regulate the power level, produce a moderate amount of vapor, and are generally priced under $100. Mods (mostly made by American companies like Surefire or various small Greek and Filipino companies) are for use with user-rebuildable atomizers, can potentially produce tons of vapor, and can be quite expensive. 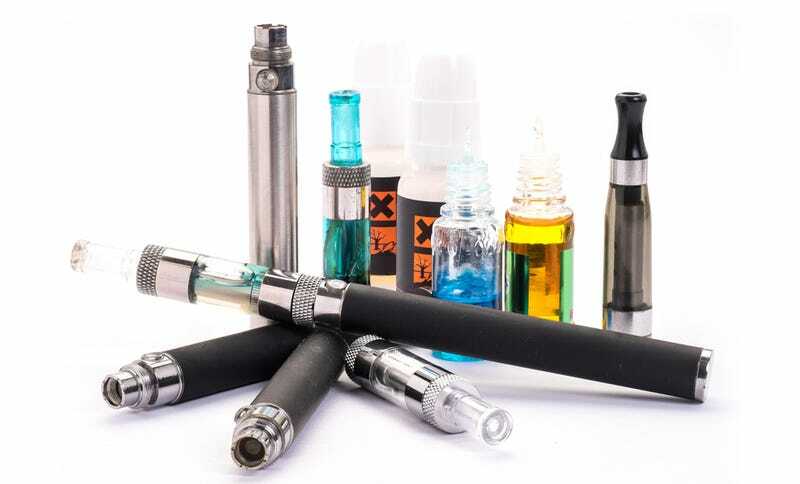 Users are typically introduced to vaping with the mass-market products on the left, move to the middle for a more satisfying vape (as the analog imitators are very high nicotine and low vapor), and end up on the right when they really start wanting more flavor and less nicotine (more on that shortly). This is likely why, as sales of mods or “open system” devices have increased, sales of disposables have plummeted (and why tobacco companies that make disposables would rather mods just go away altogether). This is important because lawmakers and the media absolutely do not differentiate between the two products, yet there is a world of difference. When they claim that “nobody knows what’s in these things,” it makes me wonder exactly what things they’re talking about, since . . .
My title at my company is Juicemaster General. I know, it’s an awesome title—I made it up. It means that I am responsible for every bottle of e-liquid that leaves one of our wholesale customers’ shelves, and I make 95 percent of it myself by hand. There are only four ingredients, and we did not find a single one of them on the surface of the Moon. E-liquid begins with the main base, vegetable glycerin. We (and most other manufacturers) use certified organic VG—the glycerin doesn’t carry flavor very well, but does produce a lot of vapor. The next ingredient is propylene glycol—this is usually cited by alarmists as being a “main ingredient in antifreeze.” This is incorrect, as they’re willfully confusing it with diethylene glycol, which has actually been found in mass market e-cig products. I absolutely do not add any of that to my liquid because I do not make antifreeze. Propylene glycol—or PG—is a main ingredient in albuterol, or asthma inhalers, and is perfectly safe to inhale when vaporized. PG is thinner than VG, and carries flavor very well—the next ingredient, flavorings, are usually suspended in PG. Flavorings are food-grade, can be natural or artificial, and are limited only by the imagination of the juice maker. A note about these ingredients—the “we don’t know what’s in these things” arguments dissolve in the face of numerous studies like these, showing that not only do we understand completely what’s in these things, but we also have a solid understanding of their (negligible) toxicity when vaporized. The final ingredient is pharmaceutical-grade nicotine, and all juice manufacturers make their product available in varying nicotine strengths. They range from ridiculous (up to 36 milligrams per milliliter—basically a Lucky Strike with the filter ripped off) all the way down to nothing at all. That’s right, zero. So what’s the point of selling a “tobacco product” with no nicotine, you ask? You may be tempted to think I’m full of crap, but our sales figures don’t lie: In our business, e-liquid in very low to zero nicotine strength (6 mg per ml and below) outsells medium-to-high strengths (12 mg and above) by better than a two-to-one margin. Also, considering that literally every single e-liquid manufacturer offers zero-nicotine liquid—and at least one makes only that—it’s safe to say that there would be no supply if the demand did not exist. I personally had quit smoking for two years before I started vaping, and I use zero-nicotine liquid daily. There are reasons for this. Most users start off at a high nicotine level when they are still getting off of analog cigarettes. When a beginner graduates to a device that produces more vapor, they don’t need as high a concentration of nicotine to be satisfied. Then, they may want to further “step down” (decrease the nicotine strength) once they find that high nicotine actually screws with the flavor of an e-liquid. Simply put, the less nicotine you use, the better your liquid will taste and, despite what media pundits seem to think, it turns out that even adults like things that taste good. And I don’t mean “kid-friendly” flavors like watermelon and blueberry—although I do have a good blueberry vape if that’s your bag. One of our blends is an extremely complex mixture of oatmeal, rum, raisin, and anise. Another is an ice-blue, damn near unidentifiable tart-sweet menthol blend called Heisenberg. We’re not going for the kiddie market here. You may be picking up that I’m referencing the many, many media assertions that we’re “targeting” children—trying to hook in kids with sweet flavors, and maybe even get them smoking. Say, did you know that . . .
You may not have realized this had been studied so extensively, and I could link to many more. I’d like to draw attention to that last study, however—the one focusing specifically on “secondhand” vapor. The first inroads being made into legislating our industry are arguing that vaping should be restricted to the same areas as smoking as the vapor isn’t safe. Across the board in our industry, though, the feeling is that . . .